Professor Mark Osler tagged me in a Facebook post linking to his opinion piece in The Hill advancing the idea that Sen. Amy Klobuchar should run for president in 2020. Perhaps the tag was to invite comments from me; I hope so, because I have some. They aren’t the same as the professor’s, though. The professor says he doesn’t know if Klobuchar wants to run; I think she has been running for a long time, biding her time. She doesn’t wear a cloak of ambition; her ambition is cloaked. That’s fine, really. We don’t want somebody who doesn’t want the job. The appearance of lusting after the presidency is off putting; Hillary Clinton’s naked ambition was (is?) one of her least attractive attributes. That could also be said of some of the other hopefuls mentioned by Professor Osler. Senator Klobuchar has been to Iowa. She also wrote a memoir. That’s two boxes checked. She’s running, obviously. Mark also mentions with approval Sen. Klobuchar’s handling of questions directed to Judge Kavanaugh and her closing remarks after Kavanaugh’s Supreme Court hearing as well. They are the high point of her Senate career, without question. I greatly admired what Sen. Klobuchar said, too. 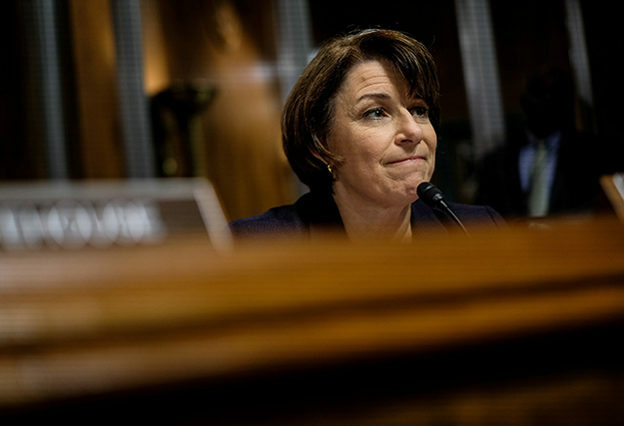 Based on the Kavenaugh hearings, a number of people think Sen. Klobuchar is presidential timber. Does anyone remember, in her twelve years in the Senate, a truly remarkable speech delivered by Sen. Klobuchar on the floor of the Senate? A genuine stemwinder on an important issue of the day? I don’t. Maybe readers will remind me. Sens. Humphrey, Mondale, Gene McCarthy, Wellstone, and Franken spoke memorably on many occasions. I think this is because they were passionate about things. To me, there is a curious lack of passion in Amy Klobuchar. Some see this as an asset; I don’t. Sen. Klobuchar has a lot of political capital, but she hasn’t seemed willing to spend any of it for something she believes in. The conservation of political capital is the Prime Directive. Apparently, several Republican senators think she is really funny. Jesse Helms hated Paul Wellstone. Some activists I know call Sen. Klobuchar the “Queen of Small Ball.” This isn’t entirely unpejorative. Al Franken was a lion for ‘net neutrality; Sen. Klobuchar was not. It was Al Franken, not Sen. Klobuchar, who asked the questions of Jeff Sessions in the hearing for his appointment as attorney general that caused Sessions later to recuse himself from the investigation into Russian interference in U.S. elections. Al isn’t a lawyer. But I think he is a better – certainly more prepared – cross examiner than Sen. Klobuchar. When it came to a bunch of Democratic senators trying to score political points off of Al Franken and force him to resign, though, the best that Sen. Klobuchar could do is say that she thought that Al would do the right thing. Not, Let’s give Al his day in front of an ethics committee where his accusers also have to come before it and testify under oath. I will be direct. I thought this was political cowardice. Sen. Klobuchar claims now that she didn’t call for Al’s resignation. She didn’t lift a finger to help him either. It is hard to recall Sen. Klobuchar’s policy positions on most things. There are a couple I do remember, though. Sen. Klobuchar is in favor of the repeal of the medical device tax because it is such a hardship for Minnesota companies. It is a tax intended to raise revenue to help offset the Medicaid expansion in the Affordable Care Act. It is also an excise tax; all device manufacturers, both foreign and domestic, pay it. It puts no Minnesota company or manufacturer at a disadvantage; I challenge Sen. Klobuchar to identify a case where a heart valve or pacemaker manufacturer in Minnesota was deprived of a single sale because of the tax. It doesn’t depress employment; I also challenge the senator to identify a single patient who was deprived of a medical device because of the device tax. Naturally, among the beneficiaries of the Affordable Care Act and the expansion of Medicaid are the medical device companies, since more covered people will need more devices. Sen. Klobuchar also supported the (Tina) Smith amendment to bypass all that fussy administrative stuff and do a swap of federal public land with PolyMet to facilitate opening a copper sulfide mine in water-resource-rich northern Minnesota. There is a current federal law that prohibits swaps like this, by the way, but never mind. Thankfully, the amendment with stripped out of a conference committee bill this fall: a Republican-controlled conference committee. Update: Just recently, both of Minnesota’s senators complained on Twitter and elsewhere (but not on the floor of the Senate, as far as I know) about President Trump’s appointment of Matthew Whitaker as acting attorney general because it imperils the Mueller investigation, which is true. Sen. Mitch McConnell says he won’t bring any legislation to protect Mueller to the floor. A lawsuit was started by three senators to stop the Whitaker appointment on the grounds that it is unconstitutional. Neither Minnesota senator joined the suit. You all remember the bromide about how you can tell a lot about a person by how they treat the wait staff when they go out to a restaurant? Sen. Klobuchar has one of, if not the, highest rates of staff turnover in the Senate. “Former employees of Amy Klobuchar” is its own demographic. I admit this bothers me because I think there is a folksy truth in the bromide. Maybe Sen. Klobuchar can turn me around in the next couple of years. She has her work cut out for her, though. And Amy’s not a journalist, either!